GREENWOOD VILLAGE, Colo., Oct. 15, 2018 /PRNewswire/ -- 'Tis the season for YUMMM® at Red Robin Gourmet Burgers and Brews! The Gourmet Burger Authority™ is lighting up its menu with new additions and limited-time offerings for the holidays. 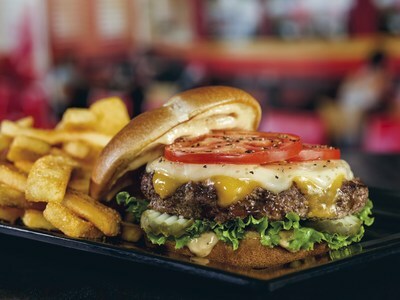 Beginning today, Red Robin guests can savor The Master Cheese, a new Black Angus burger with a duo of melted extra-sharp Cheddar and Provolone cheeses, Bistro Sauce, dill pickle planks, shredded romaine and tomatoes on a toasted brioche bun and served with Bottomless Steak Fries®, which means free refills. Red Robin is also unwrapping a fire-grilled Haystack Tavern Double burger. The newest everyday value offering is topped with American cheese, Campfire Sauce and onion straws, along with a side of Bottomless Steak Fries® all for $6.99. "We're excited to unwrap a new lineup of seasonal flavors and innovations this holiday season," said Dana Benfield, senior vice president and chief marketing officer. "From the savory Haystack Tavern Double and The Master Cheese to the decadent Peppermint Swirl Finest Shake, there's something craveable for every guest's wish list at Red Robin." There's something for everyone this season at Red Robin. For more information about the new editions and limited-time offerings, or to find the nearest Red Robin restaurant, visit www.redrobin.com. To sign up for the Red Robin Royalty® loyalty rewards program, visit www.redrobin.com/royalty.